Nitrous Anti Spy leaps another giant step forward from previous versions. With revisions in our software’s code we have certainly outdone ourselves this time! Aside from making our existing functions even better we’ve added many extremely powerful new features. Including the “Spyware Finder” which acts as an agent that searches through your computer for suspicious lines of code that could have the potential to monitor and record actions or sensitive information and post it online. As it begins NOW - Internet and computer protection will never be the same again! Nitrous Anti Spy is your single solution for virus, Trojan, hacking AND spyware protection on your personal computer. With Nitrous Anti Spy , you give yourself the power to stop malicious attacks against you and your families’ privacy and data. With the ability to scan system and startup files as well as monitor all applications that your operating system is currently running. The software also includes a port scanner and firewall to lock out malicious hacking attempts your system. Nitrous Anti Spy also notifies you each time there is an outside intruder attempting to compromise your system including the technique tried and the IP address of the attacker! If you, much like millions of other Internet users have sensitive information on your computer DO NOT hesitate to save your data while you can! Never misjudge the security of your computer. Let Nitrous Anti Spy give you the comfortable online experience you deserve. Nitrous Anti Spy has revolutionized its scanning code! This new method allows a brief but incredibly thorough search of specified areas of your computer. The scan code from before, aside from being improved upon, is now the “deep search” which gives you the power to scan every nook and cranny of your systems hard drive. We highly suggest you use the “deep search” for overnight scans of your system for infected files. Nitrous Anti Spy also comes pre-packaged with a Memory Scan feature! This scan allows you to scan any application currently running on your computer. The Spyware Finder is very similar to this feature, however the Spyware Finder actually shuts down and disables the application in stride. Now that we’ve told you everything about Nitrous Anti Spy , get ready for more! 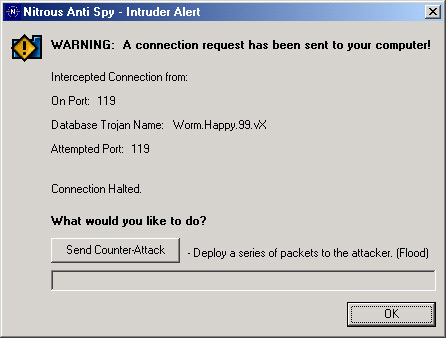 Nitrous Anti Spy does not conflict with other Anti-Viral protection programs. In fact, we suggest you keep your anti-virus programs as to add more protection to your personal computer. Finally we’ve designed this software to be incredibly user-friendly and resource-friendly. Nitrous Anti Spy is designed to allow a user to scan files that he or she have downloaded or found and are not familiar with. Our software does not automatically scan every file as it is opened and does not load during Windows startup. We also do not make changes to your Windows registry or .INI files. Nitrous Anti Spy does nothing secretly – you are in control. Nitrous Anti Spy also is easily scalable to update its virus database and new versions of the software itself. Your Anti-Virus software keeps your machine protected from all the nasty viruses that can cause serious harm to your files and computer. But what about your Internet safety, chat conversations, even your identity! Nitrous Anti Spy protects your computer from hackers, spyware and Internet Trojans. Trojans such as “Sub Seven” – a program that allows someone access via the Internet to watch your every move and control your computer undercover, leaving you susceptible to even more attacks. Nitrous Anti Spy has been tested on machines with Norton Anti-Virus, Anti-Virus expert and Dr. Solomon’s Anti-Virus. These powerful anti-virus applications along with Nitrous Anti Spy can ensure you and your computers complete security. Our interactive tutorial will show you the ropes of our software with ease! Screen shots of Nitrous Anti Spy along with documentation on how to effectively use the software is also included. Displays the number of viruses/Trojans detected. Displays information about the keywords used in virus/spyware detection. Scan Code for Standard Search has been upgraded to 6x faster than original. Deep Search converted from the original standard search. Even easier to use interface. Professional update feature, including BUILD checking to ensure you have the latest software version. More spyware and trojan definitions. Runs on Windows 95, 98, ME, 2000 and XP. Gives the user full control of the program. It does not make any changes to your startup files or registry unless the user tells it to. Ability to exit a directory scan faster than the previous version. Ability to update its virus databases, as well as the EXE itself. Simple, quick, and professional Setup. out there in circulation that Nitrous Anti Spy detects. AOL.PWS. * - Majority of PWS are detected. * Note: Nitrous Anti Spy provides detection of majority of versions, not just one. Nitrous Anti Spy can detect over 250+ of the most common SpyWare programs out there, plus many other trojans and some nasty viruses! Anti Spy or SpyCop? - Click here to see why Nitrous Anti Spy BLOWS SpyCop out of the water! Pentium or AMD CPU 166Mhz and higher. The Windows® Logo is Copyright Microsoft.